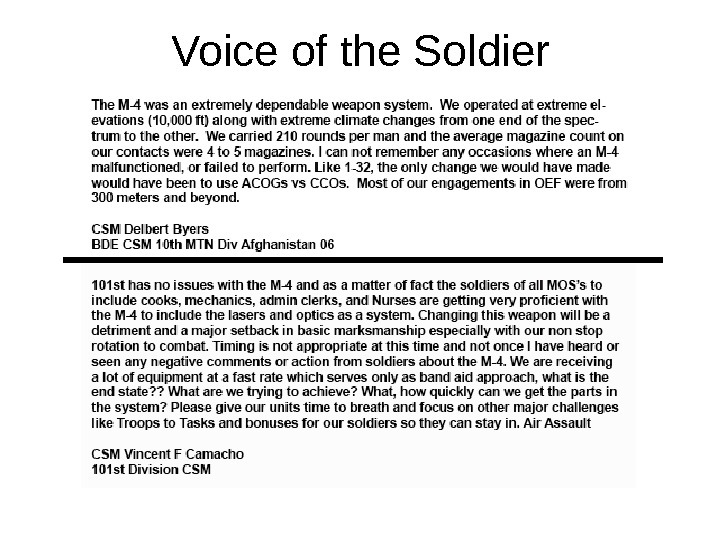 12 December 2007; 1255 hrs Version 3. 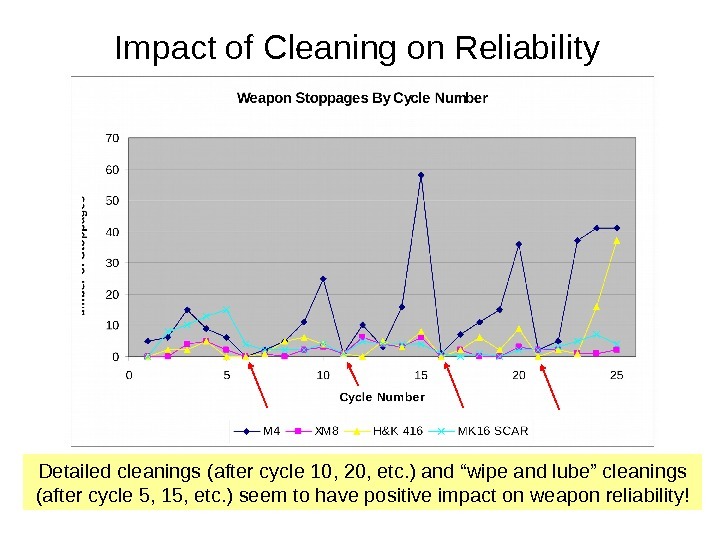 5 Impact of Cleaning on Reliability Detailed cleanings (after cycle 10, 20, etc. ) 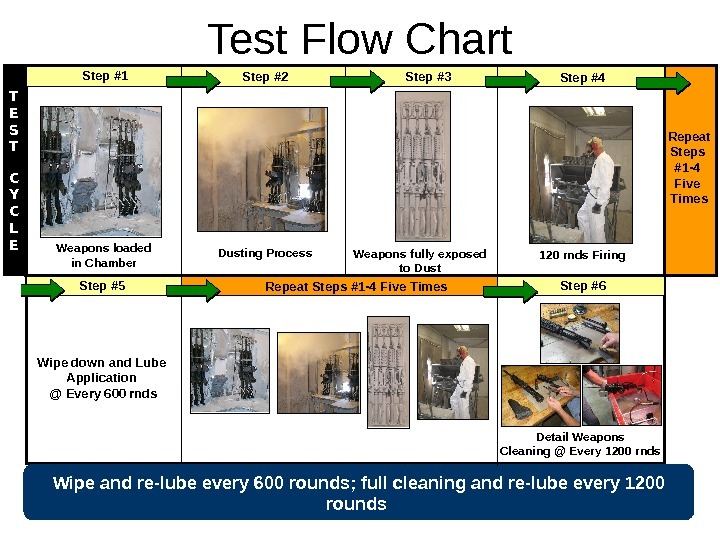 and “wipe and lube” cleanings (after cycle 5, 15, etc. ) 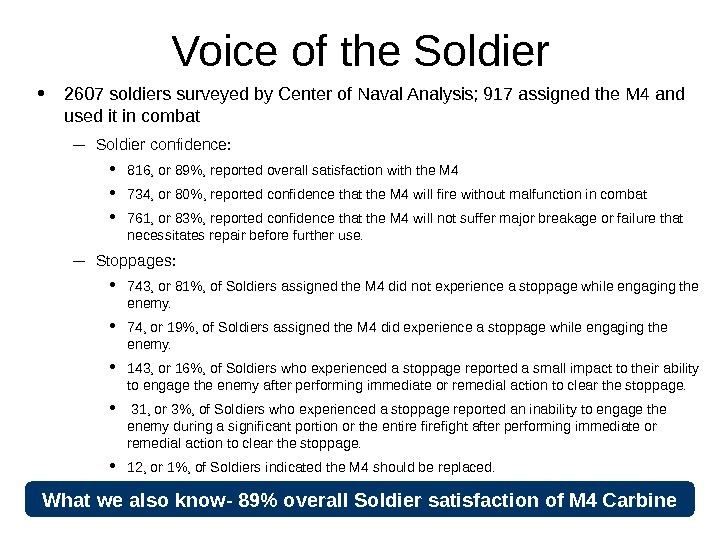 seem to have positive impact on weapon reliability! 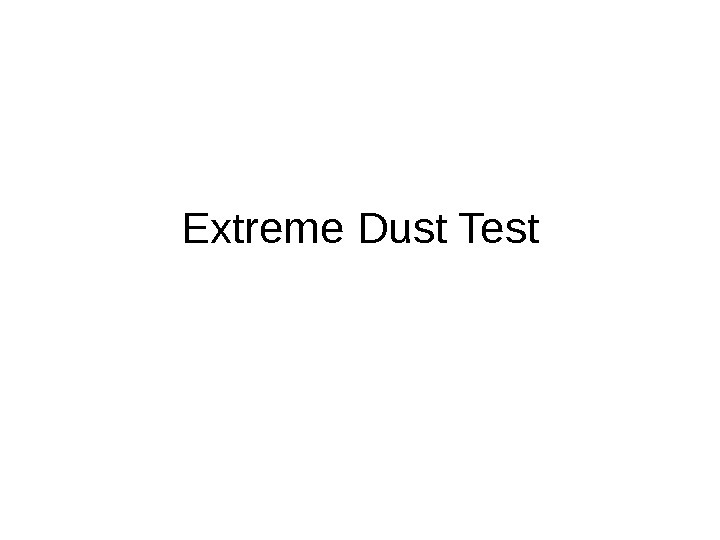 12 December 2007; 1255 hrs Version 3. 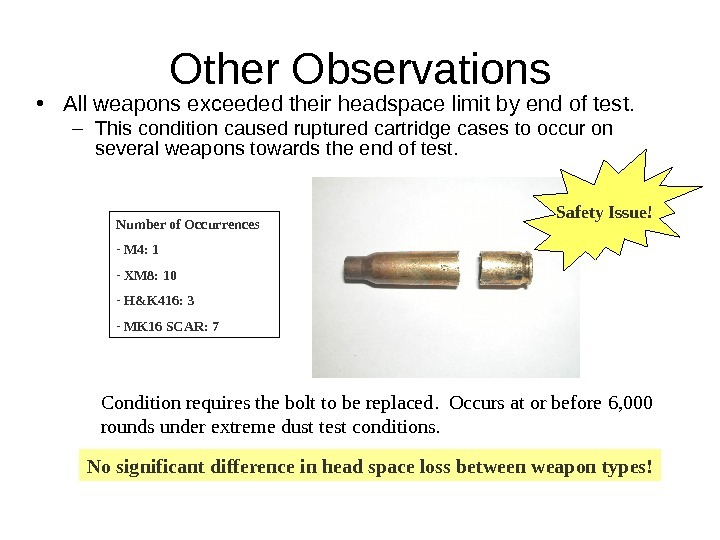 5 Other Observations • All weapons exceeded their headspace limit by end of test. 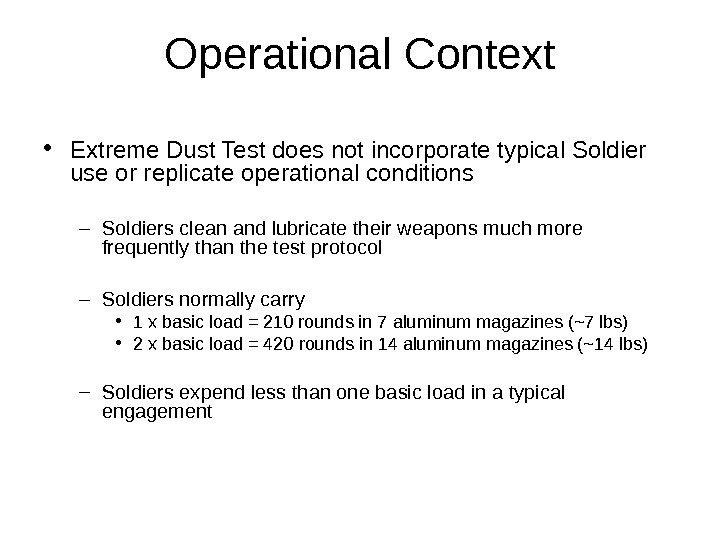 – This condition caused ruptured cartridge cases to occur on several weapons towards the end of test. 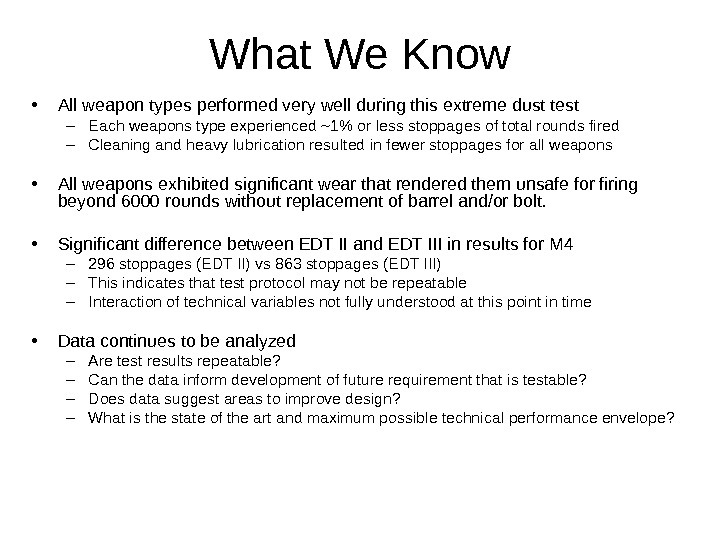 Number of Occurrences — M 4: 1 — XM 8: 10 — H&K 416: 3 — MK 16 SCAR: 7 Safety Issue! Condition requires the bolt to be replaced. 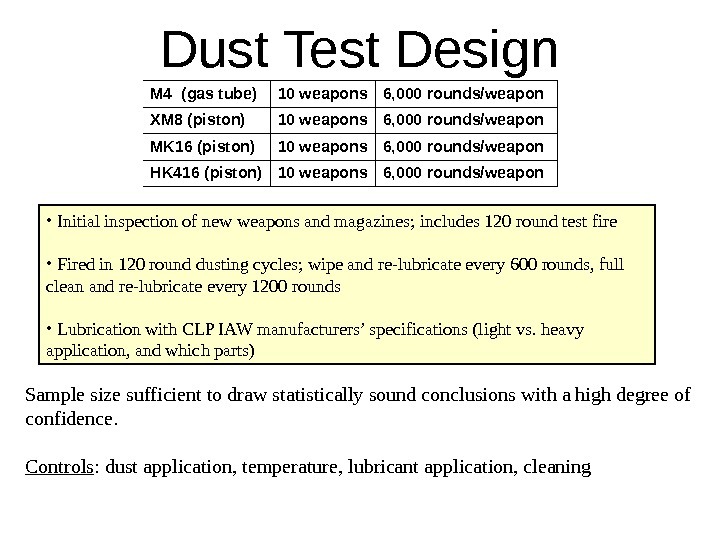 Occurs at or before 6, 000 rounds under extreme dust test conditions. 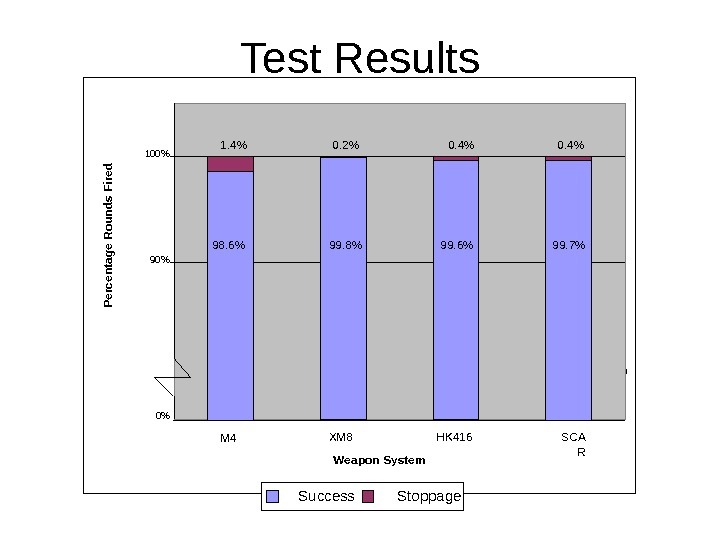 No significant difference in head space loss between weapon types! 12 December 2007; 1255 hrs Version 3. 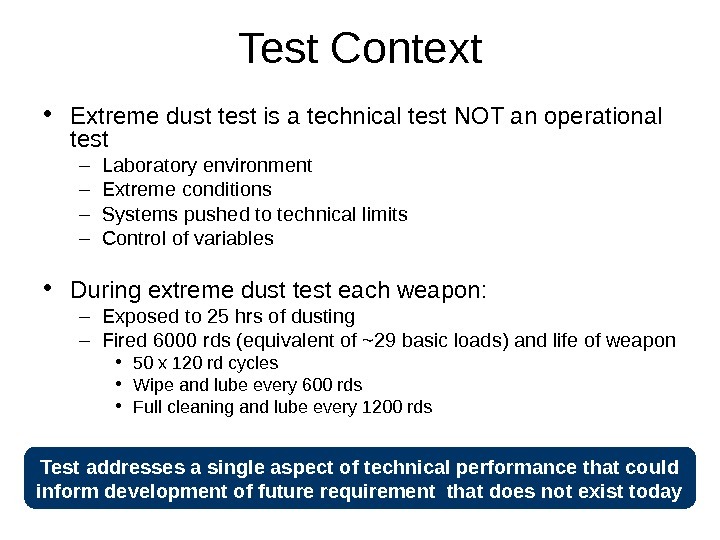 5 What We Know • All weapon types performed very well during this extreme dust test – Each weapons type experienced ~1% or less stoppages of total rounds fired – Cleaning and heavy lubrication resulted in fewer stoppages for all weapons • All weapons exhibited significant wear that rendered them unsafe for firing beyond 6000 rounds without replacement of barrel and/or bolt. 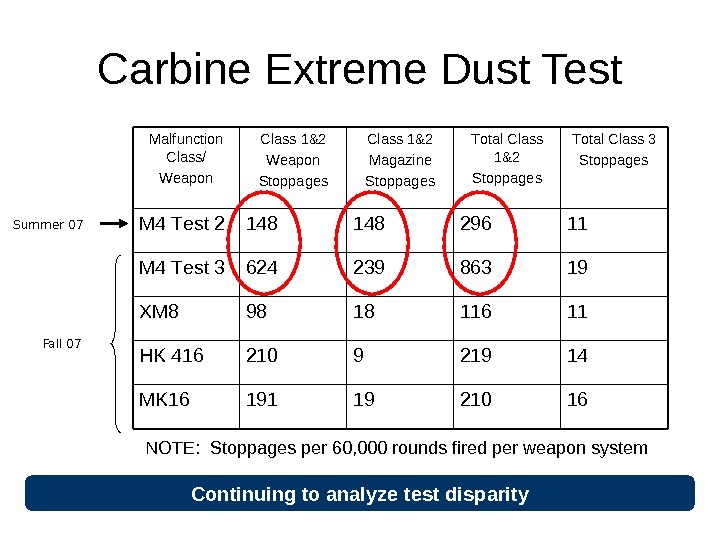 • Significant difference between EDT II and EDT III in results for M 4 – 296 stoppages (EDT II) vs 863 stoppages (EDT III) – This indicates that test protocol may not be repeatable – Interaction of technical variables not fully understood at this point in time • Data continues to be analyzed – Are test results repeatable? 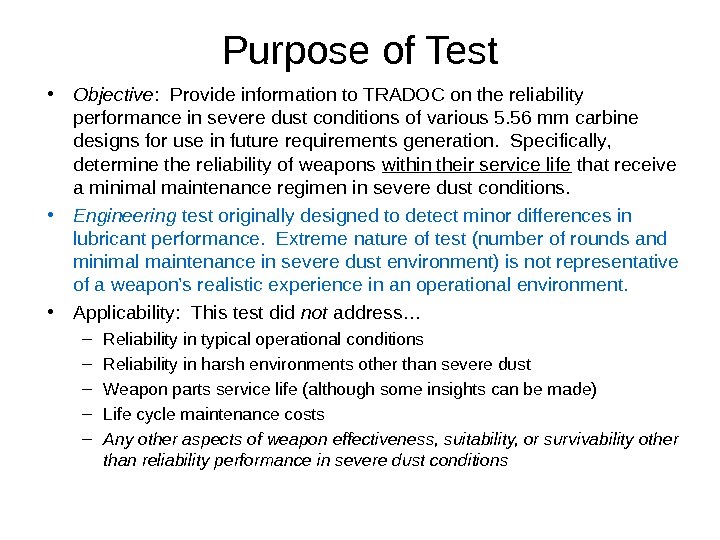 – Can the data inform development of future requirement that is testable? 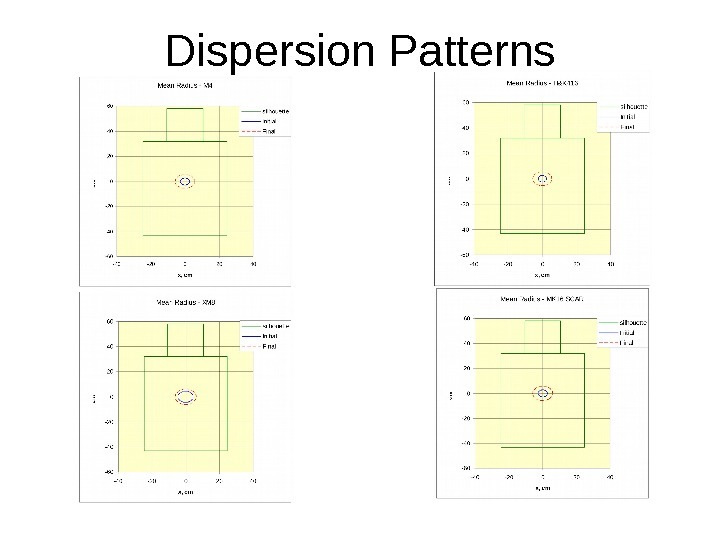 – Does data suggest areas to improve design? 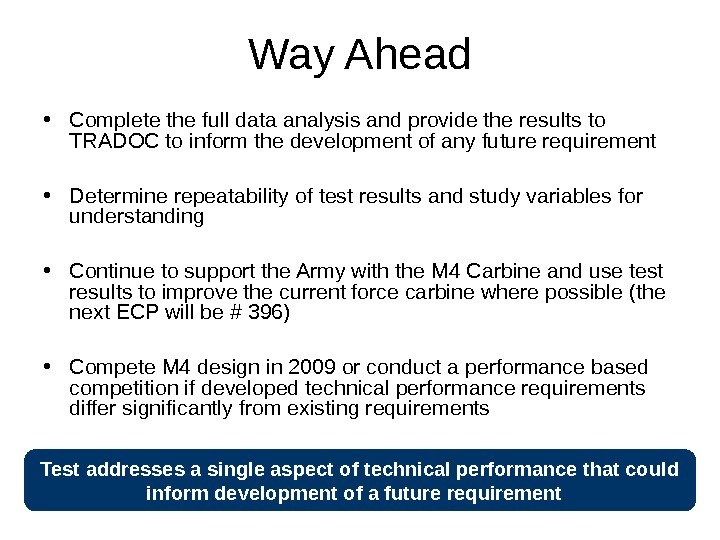 – What is the state of the art and maximum possible technical performance envelope? 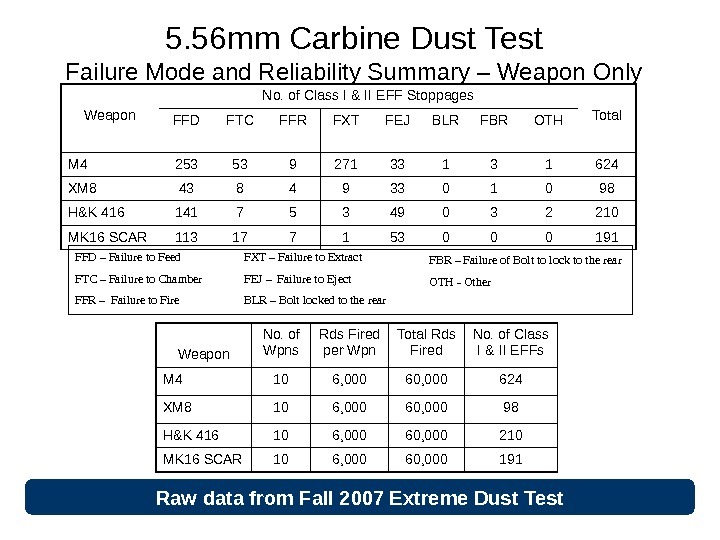 12 December 2007; 1255 hrs Version 3. 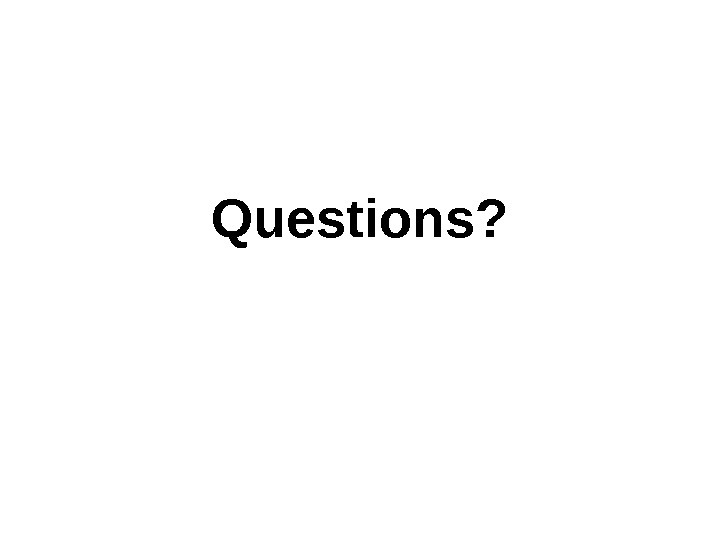 5 Questions?